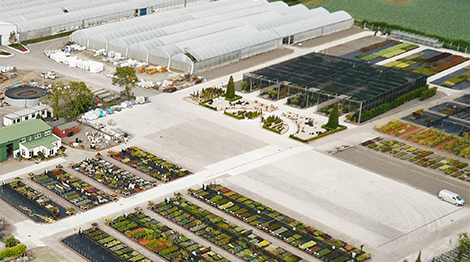 Since the mid 70’s, Tully Nurseries has grown to become one of Ireland’s leading wholesale nurseries. We supply landscape contractors, garden centres, DIYs and supermarkets in Ireland and the UK. Our family run business employs 45 full time staff from all over Europe. And comprises of 2 departments; an 8 acre plant centre & a 17 acre nursery. So, we are really proud of our team, some of whom have been with us for over 15 years. 8 acre Plant Centre: Our plant centre supplies customers in Ireland with a wide range of excellent quality plants, trees and garden products. Furthermore, at any given time stocks about 4000 different products from young bedding plants up to specimen trees €10,000 each. In addition, It is our goal to provide enough of variety for landscapers, gardeners & designers. So they can plant excellent quality gardens with something unique or unusual in each garden. If that isn’t enough our experienced horticulturalists source from a network of over 75 regular suppliers throughout Ireland, UK, Europe. And as far afield as Australia & New Zealand – we work extremely hard to provide a prompt solution to some of the most difficult sourcing lists. 17 acre Nursery: Our nursery specialises in growing and supplying well branded quality plants to garden centres, DIYS and discounters in Ireland & the UK. Through listening to your feedback and observing current trends, we have fine-tuned what we grow and the way we package it. While our Shrub category still remains strong with our specialist lines such as Hebes and Lavenders, our range of Alpines, Perennials and bedding plants are growing significantly. Especially, where you our customers are demanding more impulse type plants. Your ideas our expertise: We continuously innovate through trialling & testing new products and packaging in leading retailers and in our own plant centre. Thus, we have introduced a number of successful Hebe varieties of our own over the past 15 years. Our production facility of 5.5 acres indoor and 4 acres outdoor produces approximately 750,000 plants annually. All this in sizes varying from 1 Litre pots up to 5 Litre pots. Our plants are Bord Bia quality assured. And are sold mostly under the Bella Bloom Plants brand and also under the Winning Plants brand. And where necessary, we use own label brands. So, welcome to Tully Nurseries Ltd.